Join us for an entertaining event of painting while enjoying the company of your friends. We will provide you all the materials. Contact us to book a date. Choose a design from our Gallery or request a custom painting two weeks in advance. We will sketch it on the canvases for you and your guests to have more fun painting and socializing! Then we will direct you how to paint it step by step. At the end of the event, each painting will look great and realistic as we would instruct each guest, one on one to paint their masterpieces. You will finish your session with a piece of art that will amaze you! A memorable event for all! 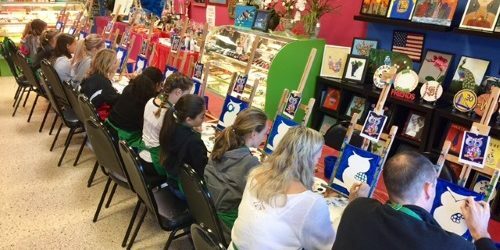 Birthdays, Girl’s Night Out, Family Art Night, Class Fundraisers, Kid’s Team Parties, Special Events, Date nights, Mother –Daughter Events, or just for a group of friends to have fun! Watch the video of our painting parties here. Schedule a painting party any 2-3 hours, Wed – Sunday. The minimum group size of an art party is eight guests. You may bring your food and beverages (finger foods, pizza or appetizers and desserts) and set up your buffet at our party room. Paint, a prestretched canvas, brushes, apron and an easel. Additional assistants are on a need bases. A credit card number is required at the time of reservation. To secure your space, we need a deposit charged towards the booking. The Party will begin promptly at the scheduled time, for that reason, please have your guests at the Studio 15 minutes before time to allow for check-in, visiting, etc… A delay of the party time by the Host, Hostess or Guest may result in an additional charge to credit card posted , $30.00/each extra thirty minutes. Cancellation: please email one week before the scheduled date. You may call but you still need to email as the official notice. There is a $100.00 non-refundable charge if cancellation within the 72 hours. Color Bundles allows any outside guest(s) the opportunity to select any painting from our gallery or a personal photo (selected pictures should be clear and detailed). Additional questions, please email us at sales@colorbundles.com. Reschedule the party; all terms will be transferable as long as Color Bundles receives a notice prior to scheduled date. Cancellation, please email 48 hours before the scheduled date and time. You may call but you still need to email as the official notice. Color Bundles reserves all rights with cancellation. Updates are available at either the web site, or the face book page. Color Bundles does not guarantee painting results. Party updates are the responsibility of the Host or Hostess. A Party will begin promptly at the scheduled time; for that reason, please have you guests at the Studio 15 minutes before time to allow for check-in, visiting, etc.. Failure to select a painting within the appropriate time may lose the time and date. Like us on Facebook.com/colorbundles to follow our new events and watch the video of our parties. You may pay on the phone or at the studio. We accept debit or credit cards, checks or cash.